Looking to watch iFollow from the UK? Whether you’re travelling and want to sign up for the regular price or just want to bypass regional soccer blackouts, a Virtual Private Network (VPN) can help. In this post, we’ll list the best VPNs for iFollow and explain how to use them. VPNs encrypt your traffic, preventing it from being read by your Internet Service Provider (ISP), employer, or government. However, they also allow you to change your IP address, meaning you can use a VPN to spoof your location and access geo-restricted services abroad. iFollow is available worldwide, but it works slightly differently in the UK. For instance, it’s more expensive (matches cost £10 each, instead of $7 USD). If you are visiting the UK you may find you can’t stream as many live games as you could from outside the UK, since some games are not available in every location. Many iFollow users avoid such restrictions by using a VPN. However, due to this platform’s strong geo-blocking, only a handful of VPNs which work reliably. Aside from being hugely popular for streaming, VPNs help keep you safe and private online, which is particularly important if you are using unsecured public wifi. ExpressVPN: A secure, high-speed VPN which unblocks a wide range of geo-blocked services abroad, ExpressVPN makes it easy to stream live sport from anywhere. NordVPN: This service offers fast connections, customizable security features, and exceptional unblocking ability at a very reasonable price. CyberGhost: Boasting streaming-optimized servers, high-speeds, and a strong commitment to your privacy and security, CyberGhost is ideal for users new to VPNs. ExpressVPN offers access to more than 3,000 servers in 94 countries. It’s very reliable and fast enough to stream live HD video without any noticeable buffering. Best of all, this service is capable of unblocking stubborn streaming platforms like Netflix, Sky Go, and iFollow from anywhere. This VPN keeps you safe using 256-bit encryption, DNS and IPv6 leak protection, perfect forward secrecy, and a kill switch (which stops all traffic whenever you disconnect unexpectedly). ExpressVPN doesn’t log any identifiable information but you can pay with Bitcoin if you’d like another layer of protection. Live chat-based support is available 24/7. ExpressVPN has apps for Windows, Linux, MacOS, Android, and iOS devices. It offers custom firmware for routers to make installation as easy as possible. BEST VPN FOR IFOLLOW:ExpressVPN is our top choice for iFollow. It’s fast, secure, and offers excellent unblocking ability, making it ideal for streaming live sport. It even comes with a 30-day money-back guarantee so you can try it risk-free. NordVPN has the largest network of any major VPN, with more than 5,400 servers spread across 62 countries. It’s very fast and easily unblocks services like Netflix, beIN Sports, and iFollow, so it’s ideal for streaming. With up to six simultaneous connections permitted, you’re free to watch live EFL soccer both at home and on the go. This service takes your security seriously. Features include 256-bit encryption, a customizable kill switch, ad-blocking, malware-scanning, dual VPN and Tor over VPN functionality, and protection against WebRTC, IPv6, DNS, and port-forwarding leaks. NordVPN has a strict no-logging policy so your privacy is in good hands. If you need help, you can reach customer support 24/7 over live chat. NordVPN apps are available for Linux, MacOS, Windows, iOS, and Android. It also works on home routers but must be manually installed. LOW-COST SECURITY:NordVPN is an inexpensive, high-speed VPN with advanced security features and the ability to unblock iFollow in the UK. Its plans include a 30-day money-back guarantee. CyberGhost is a novice-friendly yet versatile VPN with over 3,500 servers in 60 countries. Each server shows its current load as well as the service it’s designed to unblock, meaning there’s no guesswork involved when trying to stream content on platforms like Netflix, ESPN, or iFollow. With up to seven connections allowed at once, CyberGhost allows you to stream safely from all of your devices. One of the best things about CyberGhost is that it offers pre-configured security. 256-bit encryption, an ad-blocker, a malware-scanner, DNS and IPv6 leak protection, and an always-on kill switch are enabled by default. You can register anonymously (using Bitcoin and a throwaway email address) but as CyberGhost doesn’t log any personally identifiable information, this is entirely optional. Having trouble? Customer support is available via live chat 24/7. CyberGhost provides Windows, MacOS, Android, and iOS apps. It can be manually configured to work with Linux-based platforms and internet routers. EASY STREAMING:CyberGhost offers fast, reliable servers, strong unblocking potential, and comprehensive security. It comes with a 45-day money-back guarantee. First of all, sign up for a suitable VPN (we recommend ExpressVPN). Download and install the app, taking care to get the appropriate version for your operating system. Connect to one of your VPN’s servers in your desired country (most providers prioritize the US, so you’re more likely to get fast speeds with an American server). Sign up for iFollow, log in, and try watching a video. It should load almost instantly but if not, try clearing your cache and cookies, then reloading the page. Can’t I just use a free VPN instead? Free VPNs might seem appealing but we advise against using them for several reasons. First, iFollow has particularly strict geo-blocking measures in place and there are only a few paid services capable of reliably unblocking it, meaning a free VPN is very unlikely to work. Additionally, as they usually have small networks, free VPNs often struggle to provide adequate speeds. Live streaming is fairly data-intensive, and as such, you’ll likely experience frequent buffering (assuming the video loads at all). How can a free service afford to build and maintain an international server network? Usually, these VPNs use an ad-supported model or perhaps offer higher speeds for a monthly fee. There’s nothing inherently wrong with this but the problem is some services go even further and store tracking cookies on the user’s device. These cookies allow the provider to collect information regarding your browsing habits. Once enough data has been gathered, it can be sold to advertisers, most likely without your knowledge. It can be difficult to know if your free VPN is safe. Researchers recently tested over 280 free VPN apps and found that almost 40% contained malware, over 80% leaked information over IPv6, and 18% allowed users to browse without any encryption at all. Unfortunately, well-known providers aren’t necessarily any safer; in 2015, Hola was caught selling user bandwidth to help run a botnet. To stay as safe as possible, we recommend using a reputable VPN with a clearly-worded logging policy and a history of standing up for its users’ privacy. iFollow appears to have more advanced geo-blocking measures than many similar services. Despite this, it’s still possible to access another country’s version of the site when in the UK. The first step is to connect to one of your VPN’s servers in your desired region. Some users have reported that their usual iFollow accounts were inaccessible when using a VPN; while this hasn’t been confirmed, it suggests that iFollow stores your initial location during registration. To bypass this restriction, just create a new account while connected to the VPN. Now, purchase a pass for the match you’d like to see. Interestingly, although iFollow is available in several countries, it only has one website. This simply changes the currency and available content based on your IP address. In other words, as long as you have a payment method that’s valid in one of iFollow’s supported locations, you can sign up to whichever version of the site you’d prefer. You can use a card linked to a British address even when signing up for the American version, for instance. You should now be able to stream matches live without any issues. There have been reports of problems accessing the service on Chrome while connected to a VPN, so if you’re having difficulty, try switching to a different browser. Which games can I watch on international versions of iFollow? 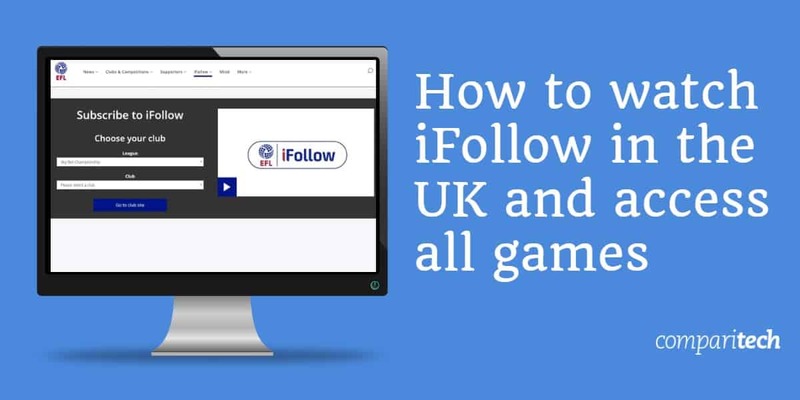 iFollow allows you to watch any EFL games that aren’t broadcast internationally, provided one of the competing teams is registered with the service. If a match is being shown by one of iFollow’s international partners, it will be available on-demand at noon GMT the following day. Further, as match passes give you access for 24-hours, this means you can rewatch a particular fixture the following day. Currently, iFollow lets you subscribe to 15 of 24 teams playing in the Sky Bet Championship, 21 of 24 in Sky Bet League One, and 23 (all but one: the Forest Green Rovers) in Sky Bet League Two. You can have as many subscriptions as you’d like, although you’ll have to create a new account for each team. Why else should I use a VPN? VPNs aren’t only good for streaming. If you log in to your online banking service when on vacation, for example, you’ll likely receive an automated alert. In some cases, these services even temporarily restrict access. While these measures are designed to keep you safe, they could cause significant problems when travelling. However, if you connect to a VPN server in your home country before logging in, your bank likely won’t even notice you’ve left the country. Public wifi networks are convenient, but rarely well-protected. As such, they’re a popular target for hackers looking to monitor users’ traffic. When you use a VPN, though, your data is encrypted and completely meaningless to anyone without the correct decryption key. Further, as your traffic is routed through servers in another country, you’ll be able to bypass any web filtering that’s been imposed by the hotspot owner or local government, and access websites that are usually blocked. 6 Can’t I just use a free VPN instead? 8 Which games can I watch on international versions of iFollow? 9 Why else should I use a VPN?